This 18K gold plated Claddagh brooch features glass stones, including one in the heart, along with Celtic knots and measures 1 3/4” long. 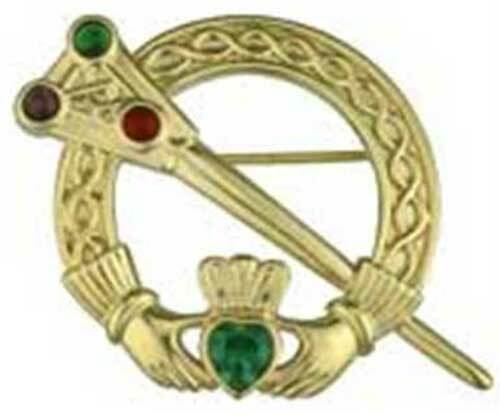 The Tara style brooch is crafted by Solvar Jewelry, in Dublin, Ireland and it is gift boxed with Claddagh and Celtic knot history cards that are complements of The Irish Gift House. Celtic brooch is a silver plated Tara design that is enhanced with multi-colored glass stones along with embossed knot-work.